I have over 26,000 photos stored online using the Flickr photo-sharing service. Granted, I am a power user, but there is an amazing array of people who also have most or all of their images on the service’s site. After all, it is the most social and functional one of its type online. Flickr is one of the most vibrant social ecosystems on the Internet. The photos range from a nearly infinite array of personal photos to the constantly growing archives of the Smithsonian. This massive investment in the platform is what is fueling the nervousness raging across the Web in the wake of news leaked from Flickr’s parent company, Yahoo! The Interwebs were up in arms yesterday, at leaked news that Yahoo would kill a handful of its ‘web properties.’ Well, few mourned the death sentence meted out to pointless services such as MyBlogLog or Yahoo! Buzz, but the denizens of Del.icio.us were positively apoplectic. Since Flickr is not on the list, why would its users be nervous? It’s really simple. If Delicious, which has millions of links curated over the years since its 2003 inception, can get dumped, it engenders little feeling of security for those archiving their photos online. This is bad for Yahoo! because Flickr is one of its only currently successful properties. Even though news has been released through the Delicious blog that the service is not actually being shut down, in a post by Yahoo’s Chris Yeh, the ripples of unease have spread across the Web, damaging Yahoo’s already shaky reputation. Just take a look at this collection of tweets compiled by Business Insider documenting the immediate reactions to the news. Then again, this is Yahoo. Outside of AOL, it’s hard to think of a tech company that has vaporized more value than this beleaguered Sunnyvale, Calif., firm. As one result, users of Yahoo’s Flickr photo-sharing service seem a little nervous lately. Sure, Flickr is a great site with an enormous and active user base that represents one of the best alternatives to Facebook and Google’s Picasa for photo sharing. But it’s also been neglected by Yahoo’s management — see this furious open letter to Yahoo chief executive Carol Bartz by Flickr user Thomas Hawk. Can you be sure that the site won’t wind up with least-favored status on Yahoo’s org chart? 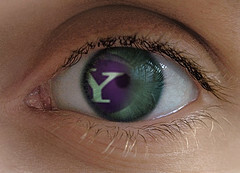 For a company that is based on the movement of information over the Internet, Yahoo seems to continue to fumble. Even though word is out that Delicious is not being taken down, but rather seeking a new home away from the Yahooligans, it came out 24 hours later. An eternity in online PR time. How naive to expect that a PowerPoint slide displayed at an all-hands meeting wouldn’t get leaked. How PR-illiterate do you have to be to not have a statement ready for such an eventuality? Yahoo has not done well in recent years. Partly this is due to confusion over what it is — Search engine? Community site? Online advertising outlet? This lack of clear identity has continued to erode the brand while PR failures like this one accelerate the process. Comparing the staff list on the cached page content of Flickr staffers [broken link removed] from Tuesday with that today, it seems that what was a 56-strong team has been trimmed by five — Tara Suan Kirchner, Joe Mud, Adrienne Bassett, Cris Stoddard, Jenn Vargas. (Thank you opendiff!) Although I’m hearing separately that six people in all have either been laid off or quit (one of the names on the ‘present’ list is gone, we understand). That’s a 9% cut, deeper than the 4% that Carol Bartz announced across the organisation in her memo of Thursday. As you may imagine, I am far from the only loyal and long-time Flickr user who is researching the best way to download and archive my pictures. I adore the service — it is one of my favorite social platforms, and I use it daily. There is just too much chaos and mismanagement going on in the Yahoo camp these days for me to trust it. I guess it’s a good thing that there are now a lot of posts up on the available alternatives. TUAW’s Stephen Sande takes a look at three options for downloading/backing up your entire Flickr account, and PINBoard has exploded with people backing up their Delicious bookmarks to the service. I really wonder what they could have done to handle this worse. Image by Yodel Anecdotal, used under its Creative Commons license.